They say Billy the Squid killed twenty-six men. They say he was a mad and violent squid who liked to kill. They say he was a thief and a robber, no better than the Catus siblings. 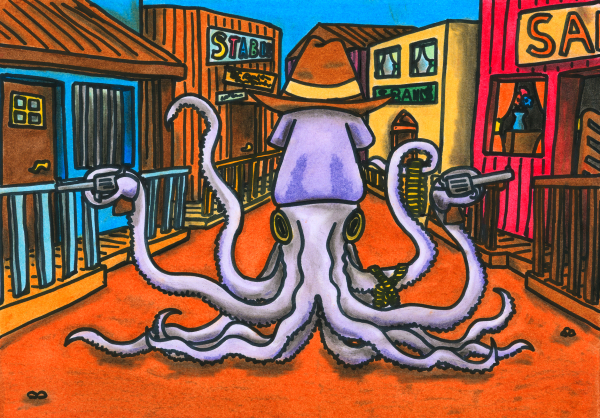 They say he was dangerous and volatile squid who would shoot you in the back without provocation. But despite what is sometimes asserted, there’s little to back up these wild accusations; what we do know of him tells a different story. He was born in R’lyeh in the dark days of the Reform Committee. His contemporaries describe young Billy as a kind, intelligent cephalopod who enjoyed reading and rarely called attention to himself. Being somewhat slender, he was often beaten up by other adolescent molluscs, which is probably what led him to develop his uniquely agile fighting style. He left home at a relatively young age, going beyond the waters his parents knew to live in the dry lands west of the sea. Much of Billy’s life was defined by cheese, so it is strangely fitting that his first crime was the crime of cheese theft. Hungry and unable to find a job, he was forced to break into a local cheese shop and steal half a kilo of Circassian cheese. He was caught a day later, and sentenced to a hefty prison sentence. After only a few days behind bars, his famous nimbleness allowed him to escape from prison through a chimney. Escaping the law, Billy travelled further south, trying to find a way to live a decent life. After stints working as a porter, a salesman, a monk, and even a cowsquid, he finally ended up working on a cheese farm run by John A. McTeuthid. Here he was accepted by the other cheese farmers as one of their own, and worked hard to make certain the cheese always lived up to its potential. He became fiercely loyal to McTheuthid, whom by all accounts he saw as a kind of surrogate father figure. But cheese brought with it great controversies in an area that was traditionally known for its tofu. The tofu ranchers resented McTeuthid and his pleasantly piquant products that were threatening to displace their traditionally tasteless tofus. Enraged by the possibility of a future full of flavoured foods, they had McTeuthid amorally assassinated. Lately evidence has emerged that they used a form of alliterating tofu almost ten times as poisonous as the normal variety. Shocked, angered and in the belief that the law would always be on the side of the rich tofu ranchers, the cheese farmers formed a posse known as the Reggianitulators and rode out to fight for justice and revenge. Thus began what has often been called the Cheese-Tofu War, a series of battles and ambushes which claimed many lives. The details of the war are sketchy, but in later interviews the locals all stressed that Billy the Squid never killed anyone except in self-defense, and was seen by many as a defender of the poor and the destitute against the tofu oligarchy. Nevertheless, the conflict did not end well for the Reggianitulators. Their enemies, inured to pain by years of eating tofu, were impossible to defeat. One by one the supporters of the McTeuthid faction fell. Infighting and a series of terrible mistakes sealed the group’s fate. Billy was captured and sentenced to hang. His captors had once again underestimated his nimbleness, however, and he managed to free himself with his tentacles and escape. Some scholars claim it would have been tremendously difficult to hang a squid anyway, and that he may in fact have escaped during a failed attempt at putting a noose around his neck. This entry in the Oneiropolis Compendium was made possible by Terry Cavanagh, a very nice eyeball from Eyerland.